“We tried a lot of other programs and this was the best!” – Jack’s mom. View our gallery to see for yourself! Other locations: Metropolitan Museum of Art, Guggenheim & Galleries. We believe that learning to think creatively is necessary to everyone’s development. Our program is designed to reach all intelligences, to go beyond school curricula to demystify art, artists and their processes with exciting advanced materials. 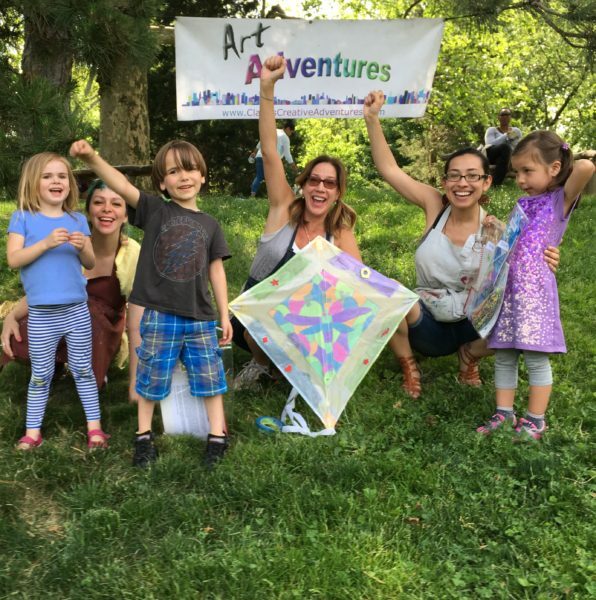 Located at All Souls Church, Art Adventures is an inclusive hands-on children’s art league that teaches art not just as a pastime, but as a means of individual expression. Children leave with confidence as they develop the courage to tackle the “artistic problems” we introduce. While exploring contemporary, modern and multicultural art, children learn to overcome obstacles, master triumphs and revel in the excitement over newfound ways to use myriad mediums! Visiting artists are also invited throughout the year to share their unique perspectives. 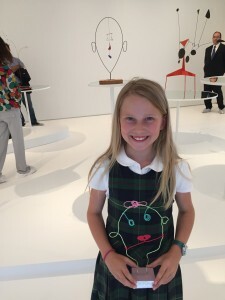 One Museum or gallery visit is included each semester for ages 4 and up. 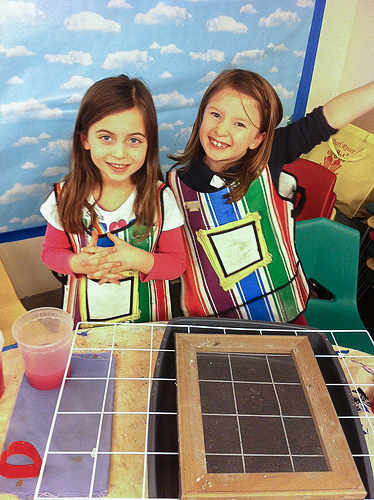 Art Adventures Studio classes visit museums and galleries more frequently. Although semester enrollment is offered, our curriculum will span the entire year. Languages are also an important part of learning about the world! We offer Art and French classes where French is introduced throughout the art processes. Modern & Contemporary artists, Multicultural arts & multi-media exploration! Tailored curriculum means new ideas and applications including classical self-portraits, line, shape and color studies & landscapes… However, here are some unique favorites along the way: Magnetic sculpture, Plaster hand casting, Pollock in the park, Wayne Thiebaud and Claes Oldenburg pop-art food sculpture, Louise Nevelson and Giacometti sculptures, Calder mobiles, stabiles and circuses, Lichtenstein patterns, African masks, cloths and mud painting, Batiking, Encaustics, Egyptian art, Japanese fish prints, Chinese calligraphy, storytelling, World Arts and so much more… mostly because processes are child-directed or reflect the museums we visit! 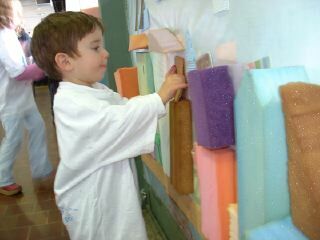 Children love our hands-on projects! Mini-Art Adventures! Where adult and child explore vast materials side-by-side, learning age-appropriate skills, language, use of tools and expectations in relationship to art, while having lots of fun! In order to instill trust and confidence, Art Adventures encourages decision making, as well as trial and error, allowing children the freedom to explore at their own pace. Special attention is placed on designing the curriculum so that lessons serve as building blocks to the next and new process. Once they have built an “art vocabulary” from previous lessons, they continue to apply their knowledge to make masterpieces the next! Because each group’s social development is equally important, children are encouraged to practice inter-personal skills hand-in-hand with learning a new art vocabulary. 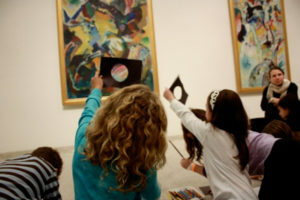 Older children may have a longer class time, visit museums more frequently and will be introduced to more advanced techniques and art vocabulary related to elevated media such as a variety of pencils, pastels, charcoals, stop-motion animation, paint and so much more, intertwined with the use of the above multi-media exploration. Sketchbooks are kept in class to reinforce topics and to record development throughout the year. Art Adventures Studio engages our older students with new projects, introduces a wider vocabulary of art, more advanced techniques such as color theory, brushwork, drawing skills, animation, photography, more advanced materials (metal, wood, wire, fabric, sculpting tools, pinhole cameras, papermaking…) and explores a step by step understanding of larger scale projects appropriate to age, level and interests. This studio class also seeks to strengthen an artist’s portfolio in preparation for applying to a new school. Classes will help students understand what kinds of art pieces go into a portfolio, and will provides basic experience in creating such pieces. Such topics may include still life drawing, (self) portraits, personal projects, and exploration of new media. The direction of a student’s learning will depend on the individual’s amount of prior experience and on the requirements of the school(s) to which he/she will be applying. This class seeks to improve a student’s ability to create portfolio quality pieces and to help select which ones are best suited for his/her desired school. Art Adventures Studio is a place for students to use the artistic process as a means to make choices to express who they are as individuals. They learn to overcome obstacles and to approach creative thinking in an ever-expanding way, promoting self-esteem and sense of courage when encountering new experiences. Outside of new materials, cultures and advanced mediums, students learn to appreciate their classmates’ varying styles and differences in approach, discovering that there is no one solution to an artistic problem, there are many. We know it can be intimidating to approach a blank canvas or paper. So loosen up with a glass of wine while learning the principals of drawing and creating art! Interested in Museum Adventures ?